ZWOLLE, La. 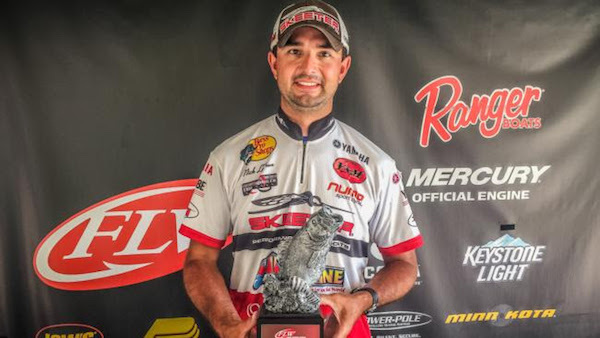 (May 2, 2016) – Nick Lebrun of Bossier City, Louisiana, weighed a five-bass limit totaling 22 pounds, 13 ounces, Saturday to win the FLW Bass Fishing League (BFL) Cowboy Division tournament on Toledo Bend Lake presented by Minn Kota. For his victory, Lebrun took home $4,866. Lebrun said he spent his day targeting shallow hay grass on the south end of the lake. Lebrun said he used one bait to catch his limit – a black and blue-colored V&M Wild Craw Jr. The Louisiana angler said he ended up catching 10 keepers. Lebrun also caught an 8-pound, 12-ounce brute – the biggest bass of the tournament in the pro division – and earned the day’s Boater Big Bass award of $595. 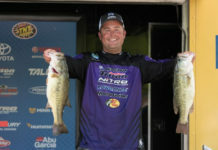 Hogan Beckley of Grayson, Louisiana, weighed in five bass totaling 14 pounds even Saturday to win the co-angler division and earn $2,136. Chance caught the biggest bass of the tournament in the co-angler division, a fish weighing 6 pounds, 8 ounces and earned the day’s Co-angler Big Bass award of $297. 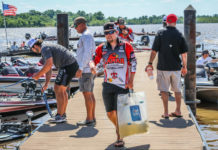 The top 50 boaters and 50 co-anglers based on point standings will qualify for the Oct. 27-29 Regional Championship on Lake Dardanelle in Russellville, Arkansas. Boaters will compete for a top award of a Ranger Z518C with a 200-horsepower Evinrude or Mercury outboard and $20,000, while co-anglers will fish for a new Ranger Z518C with a 200-horsepower Evinrude or Mercury outboard.